Want to hear something ironic? What people really need in our culture is to be to be in a community where they are loved and valued for who they really are. And yet, often out of fear of rejection we have a hard time letting people know who we really are. So we tend to fake it, fearing to reveal any aspect of ourselves that is vulnerable or broken. Because if people really knew what we were like—how unworthy or incompetent we feel —there’s a lot higher chance they wouldn’t want much to do with us. Sometimes we even fool ourselves into thinking we’re someone we’re really not. Our façade, our pretense is so good and we’ve been putting that out front for so long that we begin to believe it ourselves. Sometimes we feel like the only way we can like ourselves is if we pretend to be the person we show everyone else. Think how wonderful it would be if everyone had a community of people that surrounded them and held them in love. No matter what. Knowing their deepest secrets and worst faults, a community of people that recognizes they are wonderful nonetheless. If you’re one of those people who can be authentically who you are and still trust that you are valued, you are fortunate indeed. If you are part of a community that would go to bat for you, stand up with you, defend you, back you up—not because you’re perfect, but for no other reason that you are you, cling to it with everything you’ve got. Communities like that are, unfortunately, really rare. Even though that’s the image scripture uses to describe the church. As the body of Christ, that’s who we are and what we’re supposed to reveal to the world—this is what an unconditionally loving community looks like. For whatever reason, we have a hard time claiming our identity. When Jesus refers to himself as the good shepherd, he’s describing himself, of course. And yet he’s also describing what those who follow him are like after he’s no longer physically present as an individual person. We are the body of Christ, we lay down our lives for the sheep. That’s why Jesus sent his Spirit to his followers after his resurrection. Not so we can behave like the hired hand who runs away when things are tough, but so that we can reveal who Jesus, the good shepherd, is. Filled with his Spirit, that’s who we are. Jesus says the good shepherd cares so much that he’s willing to lay down his life for the sheep. He’s describing the community he’s setting up as well. This is the attitude of those who follow him. Willing to set aside our own discomforts, our own agendas, our own priorities, in order to show another how valuable, how loved they are. Jesus takes this to a global scale when he talks about other sheep, not of this fold. The good shepherd cares just as much for them and brings them. The goal is one flock, with all the sheep knowing that no matter what, there are others who know them, love them, value them. People of God, he’s talking about us. We’re the ones that get to know them, then love them and value them no matter what. That’s who the good shepherd is. That’s who we are as the church, the body of Christ, too. 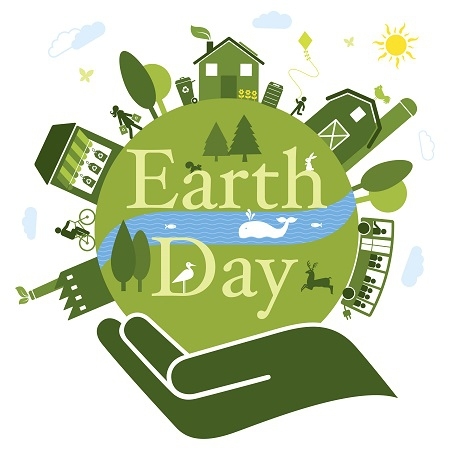 All of which means something today on Earth Day. We are called to care for and to love those most vulnerable, those whose frailties and weaknesses are known to us. Earth Day makes it clear who those are. When we care for the earth we are actually caring for those most vulnerable to climate change. For us here with every advantage, we have the luxury of continuing on with our lives, almost unchanged, even though the world is fundamentally changing around us. But there are other sheep who don’t have the resources we have, who are extremely vulnerable to the danger of climate change. There are those, largely living in poverty, who simple aren’t equipped to deal with the flooding that’s happening—which brings disease and unsanitary conditions. They are at risk from the drought—which brings hunger and an inability to make a living which continues the cycle of poverty. What these people living in danger need is a community of people that will surround them and hold them in love. No matter what. Knowing their situation, a community of people who considers them worthwhile and valuable nonetheless. They need to see what the good shepherd looks like. People who, because we follow Christ, are willing to put aside our own prejudices and even our lifestyles for their sake. People who, unlike the hired hand, won’t run away from them or ignore them or pretend their plight isn’t real. People who recognize the value of these other sheep, and take seriously the work needed to restore Creation in a way that helps people living in poverty. The good shepherd lays down his life for the sheep. Some of us experience a good shepherd kind of community, one that knows us and loves us will stand with us. But there are other sheep on this Earth Day who are suffering alone and vulnerable. It’s necessary to help these impoverished now, but it’s also necessary to eliminate a serious cause of their poverty. At the back today is some information and resources to help us be part of this holy work of restoring Creation. Even though we have the privilege of ignoring this crisis, we don’t. The good shepherd, out of love for us, has laid down his life for us, and invites us to follow him in showing those most vulnerable, those other sheep, how loved they are too. Happy Earth Day. This is it! The big day! The day of resurrection! The day we celebrate with joy Jesus being raised from the dead! We sing, we shout Alleluia! We proclaim victory! Jesus has triumphed over the grave, he is vindicated, the powers of this world ultimately couldn’t hold him down! This is great news. It is central to Christian faith. For those of us raised in the church, we have been taught about this from our very earliest days. The resurrection of Jesus is a cornerstone of our life in the church. What’s interesting, though, is that as I listen to Christian people who are willing to be honest, not everyone agrees on all points of Jesus’s resurrection. There’s a rather wide spectrum of views about it. Like it or don’t, but it’s true. We’ve got this foundational pillar of faith, and, quite a bit of diversity as to what Christ’s resurrection from the dead actually means, what it’s actually about, and, quite honestly, what actually happened that first Easter morning. Right, wrong, or indifferent, that is the reality of faithful people in Christ’s church. I’m actually grateful for the richness of interpretation on this. Because with each person I listen to who shares their perspective on resurrection, I gain a fuller awareness of God’s gift of new life that scripture describes. This is about what God does, and not so much about what we believe about it. It’s become clear to me that resurrection life isn’t just going to heaven after we die. The scriptural witness is that resurrection life is God’s gift to us here and now. It is the assurance through Christ that God has the last word for us. That word isn’t death, it is life. It is new life. And it begins now. Resurrection life means we are no longer tied to our own self-serving attitudes. We are new in God’s gift of resurrection life to serve the other. Resurrection life means we are no longer dominated by the powers that try to dictate who we ought to fear. We are new in God’s gift of resurrection life to love the other. Resurrection life means we are no longer isolated, struggling to make sure we get ahead—even if it’s at the expense of another. We are new in God’s gift of resurrection life to reach down and lift up the lowest. Jesus came to show us this new life. He came to reveal what God’s gift of new life looks like. And when he faced the powers of this world—that keep us oppressed in our fear, they arrested him. And when he faced the forces that keep us separated from each other in mistrust, they tortured him. And when he faced the violent tendencies of our world that keep us killing each other, they killed him. And when he faced the powers of death itself, God’s gift of resurrection life still couldn’t be stopped. That’s the gift that is for us today. Resurrection life isn’t a retooling of an old life of selfishness and isolation. It’s not just protection from things that cause us fear. It’s not just reducing violence to manageable level. Resurrection life is a completely new way of being in this world. It is freedom from the forces that keep us from loving and serving and showing compassion to all. We are made new, and this new resurrection life doesn’t look at all like the old life. It looks like Christ. Take a look at these little scraps of material. You can do a lot of different things with each one, but they remain torn scraps. Wash each one, iron each one, dye each one a different color if you want. It’s still just a different version of an old scrap. You can use them to clean up a small mess, or to plug a hole in drywall. They can do some good things, make some adjustments, try harder. But no matter what, they are still small scraps of material. Until they are given a new life. Marilyn Karsten took a bunch of old worthless scraps like these that were not much good for anything and gave them a new life. 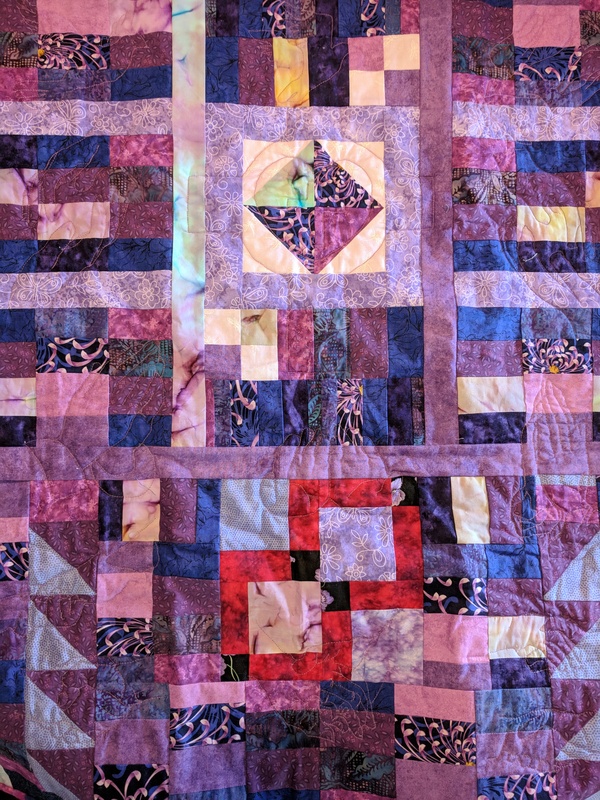 Look at this beautiful quilt made from throwaway scraps of material! These are no longer little scraps. They are now beautiful! They are no longer old, but completely new. No longer torn, but re-created. No longer separate, but whole. This quilt is something new. This is God’s gift of resurrection life. It’s nothing like the old life that the powers of this world can offer. The best the forces of our culture can do for us are ways to be better scraps. As scraps, we can improve, try hard, we can even be useful and do good things. But we remain separate. And as individual pieces, we will always be ruled by fear: fear of not having enough, of not being good enough, of not being safe enough, of someone taking what belongs to me. Resurrection life cannot even be compared with that. With this new life we are set free from fear, We recognize the value of every other scrap of material and know we are bound together with them. The beauty of this new life comes from giving away our identity as scraps because we are remade into the body of Christ. We are new, we are free to love and be loved, We live Christ’s compassion for others—not because we try harder, but because it is now who we are. And the best thing of all is that this new, resurrected, whole life has already been given to us. We are already joined with Christ in a new life. Today is the day we get to let go of the scraps. Today is the day we get to see the beauty of what we now are. Today we get to love the unlovable because they are part of this new creation. Today we get to live Christ’s compassion because Christ lives in us. Today we get this new life. Christ is risen! He is risen indeed! Hallelujah!